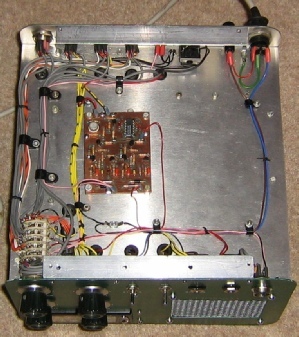 I have never been able to obtain a Heathkit SB-630 in the UK so I decided to develop my own variant built into an SB-600 case. My Z-Match already has an SWR bridge so that was not required but a spare loudspeaker was required together with a battery operated LCD digital clock with back-lighting. 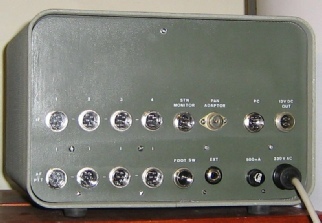 The ability to select which rig is connected to the common loudspeaker, microphone, Morse key, station monitor and panadaptor was also a key requirement. 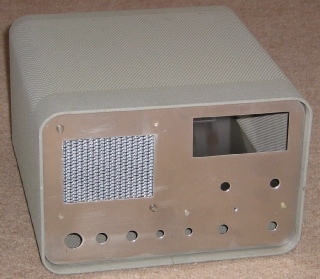 The clock was procured direct from a Chinese source and a car hifi loudspeaker with a large magnet was obtained - somewhat smaller than the original Heathkit SB-600 speaker in order to accommodate more controls on the front panel. 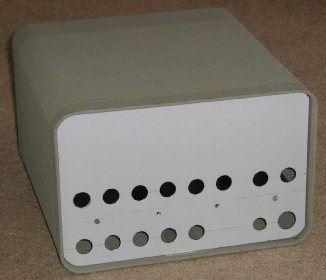 The internal structure consists of a flat chassis just above the lower row of controls and attached to the front and rear panels and a supporting rod. 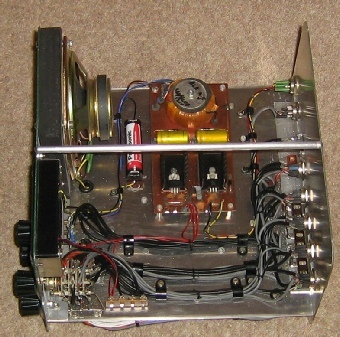 The chassis will support the internal wiring, provide screening and support a simple 12V DC power supply. The rear panel still has its protective plastic coating in place which will be removed just before the priming and painting takes place. The digital clock has a 24 hour display plus two temperature values, one with an internal sensor and one with an external sensor on a two foot extension cable which has been wired to a rear panel connector marked “EXT” to allow a single external temperature monitoring point. The PCB contains a +/-12DC regulated power supply to provide power to the clock back-light, the keying line interface under the chassis and an external aerial selector relay. The 1.5V AA battery is to run the clock instead of the original internal button cells which should result in a longer operational life. The additional wiring for this required caused mains spikes at switch-on to reset the clock so a 100n multilayer decoupling capacitor was added to the clock PCB to suppress the spikes. 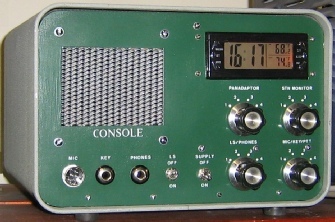 The PCB contains the keying line interface to the station monitor. This interface translates both the negative going and positive going key lines in the various rigs to a single positive going 12v signal to energise the changeover reed relay in the station monitor to allow automatic monitoring of both receive and transmit signals. The negative keying interface will work with -30V to -150V control lines. All rotary switches are break before make to prevent the various control lines in the external rigs from being connected together while changing switch positions.